Within Turkey today when examining war memorials devoted to the Great War, one absence is quite noticeable. There are no individual names recorded. At first this was tied to the cult of personality in the form of Ataturk. In the last decade beginning in the mid 1990's, there has been a relaxation of this cult and the names of individuals are rising to the surface. To its great credit, the Turkish General Staff has put together a five volume work called "Sehitlerimiz" or "Our Martyrs" which provides the details of the Ottoman and Turkish soldiers who have died in service to that state. There are many names missing from this list but it is a good foundation and the Turkish General Staff are to be commended for putting forth this research into the public arena. There were two chronic problems with Ottoman record collection regarding those who died in service during the Great War. 3. The ability of the unit to which the soldier belonged to make such a report. Post war Turkey had many provinces and towns severed from it and distributed to other nations. With this dismemberment went also the roll books held by those towns. Many disappeared or were deliberately destroyed. Within Anatolia, similar events occurred, especially during the periods of expulsion of various invaders. That we have any surviving records is in itself testimony to those few Turkish clerks who understood the value of their records and protected them accordingly. During the war, the lines of communication were poor at the commencement and as the war ground on, were degraded considerably further. Thus it was a hit and miss affair for a piece of information to arrive at the appropriate destination. Finally, if the unit to which the soldier belonged was destroyed, captured or fled without their records, then anything relating to casualties would not be transmitted. When records fell into Allied hands, they went to the Inteligence Section for translation and analysis. The records were not returned to the Ottoman authorities afterwards. The capture of Ottoman documents was always a good day for the fortunate Regiment involved in receiving them. Paper that was obviously of no value to the Intelligence Section were snapped up as writing paper as there was a huge shortage of paper in the units. Above illustrates the situation. 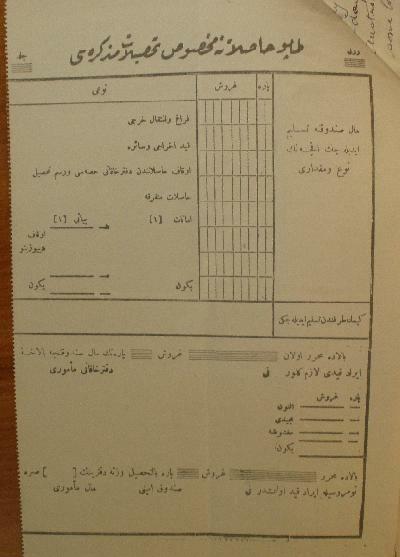 This captured Ottoman page contains a proforma accounting document originally set in a book with perforations that allowed the original to be separated and sent to the relevant authority. It was captured at Damascus and this particular page including others from this book were recycled as part of a report on the action at Kunietra in September 1918. This illustrates how Ottoman paper was employed once it was captured and formed part of war booty for the Allied Regiment. An example of how this played out. Two battalions of the 81st IR were captured at Magdhaba on 23 December 1916. While there were nearly a hundred Ottoman deaths at this battle, not one death has been recorded within the Ottoman files. Hence we have no idea as to who these men were or where they came from. All the records relating to this Regiment were captured and so nothing was sent to the town rolls and so they were not amended to reflect the status post 23 December 1916. To give an illustration of the enormous proportions of this problem, when 12,000 Ottoman troops surrendered at the Baramke Barracks in Damascus, 1 October 1918, they were confined to a POW camp which was poorly administered. Quite quickly, a cholera epidemic broke out killing many people, Allied and Ottoman alike. However, because of the conditions at the POW camp, at the height of the epidemic, over 100 deaths per day were recorded. Once the epidemic had been controlled and no one died of cholera any more, nearly a thousand Ottoman soldiers had died. To dispose of the bodies, mass graves were dug and the men tossed in. Below is a contemporaneous picture of this event. The picture was taken at Damascus in October 1918 at the height of the cholera epidemic. The reality is that none of the men in this pit was ever recorded for the Ottoman rolls. They are just nameless men buried in a pit. 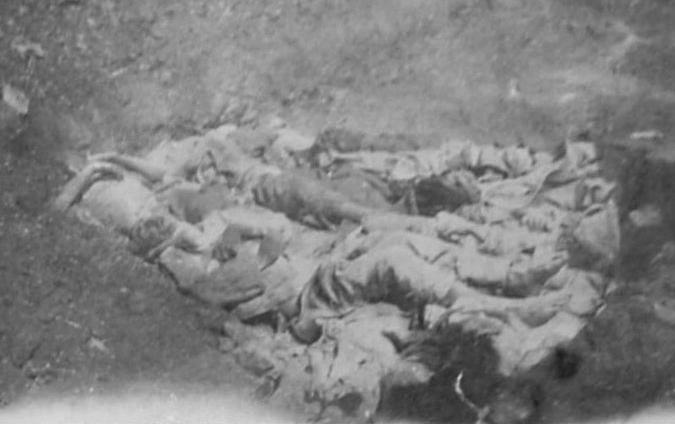 This was the fate of many Ottoman soldiers who died as a consequence of service to the empire. At the end of the day, the records held by the current archives dealing with the deaths of Ottoman soldiers during the Great War reflect at most about 10% of the total deaths leaving about 90% of the Ottoman casualties without a name or a known place of burial. As remains of Ottoman soldiers are found around the old battlefields, we can only guess as to the origin and unit of these men. They too will remain nameless as individuals. The German records are a little better but the KuK (Austro-Hungarian) are just as good as the Ottoman records. Report on a visit made in December, 1916, and January, 1917, to the Camps for Turkish Prisoners of War in Egypt, by the Delegates of the International Committee of the Red Cross. This independent document gives a good insight into to conditions endured by the various Ottoman POWs up until January 1917. 3,906 Turkish non-commissioned officers and men. The barracks for the prisoners are arranged in groups, in parallel lines separated by passages 65 feet wide. These barracks, built under the supervision of the Egyptian Engineering Department, are of uniform construction, and about 42 feet long by 30 feet wide. They are solid frames of wood with the spaces between filled in with reeds arranged vertically and held in place by crossbars. The roof is of reed thatch edged with tarred felt. Thanks to the design, the ventilation is perfect. The sandy soil shows hardly a sign of dampness. The passage between the rows of beds is made of hard-beaten earth which is very dry and easily kept clean. All along this corridor, as in all the camp roads, buckets full of water are arranged in readiness to meet an outbreak of fire. The water in these buckets is not meant for drinking, and therefore contains a little cresol to prevent prisoners drinking it. The danger of fire is further reduced to a minimum by the fact that the men smoke only out of doors and that the mildness of the climate does away with the use of stoves. Each barrack accommodates 50 men. Each prisoner lies on a mat of plaited rush, and has four blankets. Every morning the mats are brushed and rolled up and the blankets folded, so that during the day there is a large clear space inside the building. The detention cells have the same sleeping accommodation. The space left between the barracks of the separate sections is amply sufficient for exercise, which is quite unrestricted during the regulation hours. The regulation food of the prisoners being ample, the canteen plays a very minor part in the feeding arrangements. It sells tea, coffee, and light refreshments. A cup of sweetened tea costs 5 paras, or about one-third of a penny. The canteen also deals in letter paper, post-cards, thread, needles, buttons and other small odds and ends. Each prisoner is supplied with two complete sets of underwear: shirts, drawers, and socks. The uniform consists of trousers and coat of dark blue cloth. The brass buttons give it a military appearance. Everything that has to do with hygiene and the sanitation of the camp is the province of Lieut.-Colonel E.G. Garner, Medical Office Inspector of Prisoner-of-War Camps in Egypt. The camp medical service is staffed by Colonel E.G. Garner and two Armenian doctors (Arsen Khoren and Léon Samuel). Four English hospital orderlies are assisted by three Turkish orderlies. An English dentist visits the camp at the doctor's request. Of the prisoners in camp 3 per cent. have been attacked by malaria--old cases from the marshy districts of Turkey, such as Angora Yosgath, for instance. Nine per cent. have been attacked by chronic bacillar dysentery; these are treated periodically with anti-dysenteric serum. Some cases of amibian dysentery are being treated with calomel, salol, and emetine. Twenty per cent. were affected by ophthalmia due to their stay in the desert before being captured. These were treated with sulphate of zinc and protargol. The prisoners have no regular work to do. No prisoner is employed in workshops outside the camp. Even inside, except for ordinary camp fatigue duties, and some light gardening, no labour is exacted. During our inspection we saw the digging for a water supply through the camp being done by Arab workmen, not by prisoners. The prisoners are quite free to follow their own religious practices, which are performed thrice a day ordinarily, and six or seven times daily during Ramadan. Music and singing are permitted; prisoners have manufactured several guitars and violins. Most of the prisoners brought money with them; some have received sums of money from their families through the Turkish Red Cross and the International Committee of the Red Cross. They receive the amount in weekly instalments of 30 piastres (about 6 shillings) per month. Each person has a separate current account with the camp accountant. There is no relief committee in the camp; so far, no general relief funds have been sent. Sergeant-Major Hussein Hissan, a native of Constantinople, told us that, although there were many poor prisoners in the camp, there was no need to send help, as all prisoners are well fed, well clothed and supplied with tobacco. What strikes one more than anything else on entering the camp is the prevailing orderliness and cleanliness. A Turkish sergeant-major commands each group of huts, and a Turkish sergeant is responsible for each dormitory. The prisoners are smart, give the military salute and come to attention at the orders of the non-commissioned officers when those in command pass through the camp.